Organizations of all sizes have concerns about wage & hour compliance. But taking the steps to minimize risk can be cumbersome and time consuming with out the right systems of processes in place. 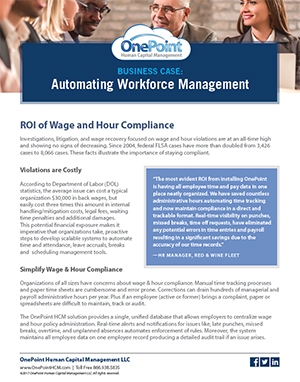 Workforce automation can solve several common wage and hour compliance issues to produce hundreds of hours of recovered time, control wage costs, and boost productivity across the organization.